To continue our dessert making saga, we came into the possession of 6! Raspberry boxes last week. So, we had to make delicious desserts. What goes better than chocolate and raspberry!? We also had that giant (1 lb) Trader Joe's 72% Cacao Chocolate bar that we bought for covering the Black Forest Torte we made...so we had chocolate around the house, and raspberries, and cream. So, this is what happened. We did not make the chocolate cups, as we also had those around the house since we picked them up to make something extra yummy. They served well. 1. Place the raspberries and sugar in a small saucepan and bring to a boil. Lower the heat and simmer until the mixture thickens. Sieve the mixture to separate and discard the seeds. 2. Melt chocolate in a double broiler. Add in the raspberry sauce from step 1. 3. Whip the cream and add in the chocolate mixture in slow stream. 4. Place into chocolate cups or glass cups. 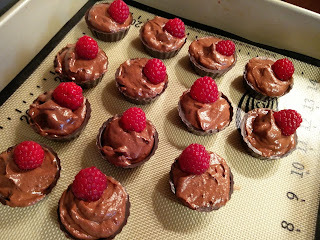 Decorate with raspberries if desired. This mousse is sooo good. Try combining the 1/3 whipping cream into chocolate first and then the rest into the whipping cream. We meant to do that, but got carried away because we were also making the chocolate raspberry cake at the same time.